When it comes to the customer experience, supermarkets lead discount grocery competitors Aldi and Walmart but trail in perception of value for the money, according to Retail Feedback Group (RFG). 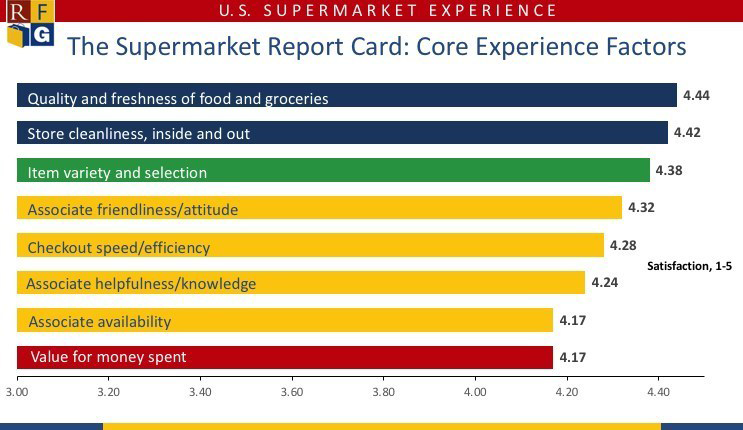 In the consumer research firm’s 2019 U.S. Supermarket Experience Study, based on a national sample of 1,200 grocery shoppers, supermarkets had the strongest overall satisfaction, with a score of 4.31 on a 5-point scale. That was just above Aldi at 4.27 but well ahead of Walmart at 3.93. The study, released Tuesday, gauged consumer feedback in such areas as the quality and freshness of food and groceries, store cleanliness (inside and outside), item variety and selection, value for the money spent, staff friendliness and attitude, checkout speed and efficiency, staff helpfulness and knowledge, and associate availability. Unsurprisingly, Baby Boomers — most of whom grew up with supermarkets as their main food shopping venue — rated supermarkets the highest, outscoring Millennials on nearly all the core experience factors, RFG said. Boomers also regarded supermarkets more highly than Generation X and Millennial grocery shoppers on such factors as quality, variety and staff friendliness. However, the factor of value for money spent scored similarly across all three generations, the researcher noted. Among the experience factors, supermarkets scored well in quality, cleanliness and variety yet moderate to low in terms of service. Shoppers rated supermarkets strongly in quality/freshness of the food and groceries (4.44 out of 5), store cleanliness (4.42) and product variety and selection (4.38). Staff friendliness was supermarkets’ highest service rating but drew a more moderate score of 4.32, followed by checkout speed/efficiency (4.28) and staff helpfulness/knowledge (4.24). The lowest-scoring service area for supermarkets was associate availability at 4.17. “Service is a critical factor given that overall satisfaction is significantly higher when service attributes receive stronger scores,” RFG observed in announcing the study. On the pricing front, Aldi shoppers gave value for money spent the highest mark at 4.51, compared with 4.32 for Walmart customers and 4.17 for supermarket shoppers. Aldi also garnered the highest overall satisfaction during the peak traffic hours of 3 p.m. to 7 p.m. with a score of 4.30, besting both supermarkets (4.27) and Walmart (3.98). RFG’s study also drilled down to some specific price attributes. Among supermarket shoppers, produce prices (3.99), meat/poultry prices (4.00) and everyday prices (4.01) earned low scores, though advertised sale items rated much higher (4.34). RFG noted that the promotional satisfaction is a key strength, since 73% of customers refer to one or more advertising/sales vehicles (traditional, social, mobile and digital) before or during a shopping trip. Customer use of digital circulars (30%) continues to grow, even as the printed circular remains more popular (51%), with Boomers (62%) turning to print more than Millennials (40%), according to RFG’s research. Conversely, usage of digital coupons (33%) has topped that of print coupons (29%) and are used across all age groups. “Retailers need to remain attentive to the trends in their local markets to ensure they are communicating value using the vehicles most relevant to their shoppers,” Numainville added. Save for value, shoppers scored Walmart lowest on the core experience factors versus Aldi and supermarkets. RFG pointed out that, in this year’s study, Aldi moved into a tie with supermarkets on quality and freshness — with 56% of customers “highly satisfied,” compared with 46% for Walmart. Potential repeat business was strong for Aldi as well. In the RFG study, 42% of those who shopped at Aldi said they plan to shop its stores more in the next 12 months, versus 22% for supermarkets and 28% for Walmart. Citing an outside measure of customer satisfaction, RFG reported that Aldi shoppers are more likely to recommend the store, with a Net Promoter Score of 44.7 compared with 40.7 for supermarkets and 27.1 for Walmart. "Aldi continues to make inroads in competing against supermarkets, with strong value for money spent and likelihood to recommend scores, as well as perceived improvement in quality, coupled with the highest OSAT scores during the peak traffic period of 3 p.m. – 7 p.m.,” commented RFG principal Doug Madenberg. “As Aldi continues to remodel stores and expand into new locations, supermarkets need to step up their game in areas like staff availability and helpfulness, maintain leading scores in quality and variety, as well as focus operationally on improving satisfaction during high-traffic time periods."